The PacSafe Coversafe S75 is the discreet, secret neck pouch slips under clothing and is the perfect place to stash your cards, cash and even keys while youíre site seeing, shopping or in-transit. The neck strap rests delicately against the skin and allows easy access to your valuables when you need them. Its Unique Fabric is exceptionally soft-to-the-touch and the Snap Button Flap Closure allows easy access to essentials, when you need them. 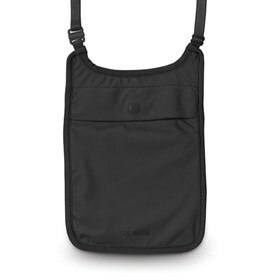 Shoulder strap : 13.4" - 26.0"
The Pacsafe Coversafe S75-Black has many exciting features for users of all types. It's one of FactoryOutletStore's best selling Pacsafe Wallets. See the Pacsafe Coversafe S75-Black gallery images above for more product views. The Pacsafe Coversafe S75-Black is sold as a Brand New Unopened Item.